ABC was tested for the EPA by Battelle Laboratories and found to meet the requirements for the effective encapsulation and removal of ACM. Prior to application it is important to determine if the existing asbestos matrix is well adhered to the substrate. Correct any surface defects and clean all surfaces thoroughly. Be careful not to agitate asbestos fibers during preparation; this could increase asbestos exposure. Stir ABC thoroughly to achieve a uniform consistency. ABC may be diluted with water for different applications. 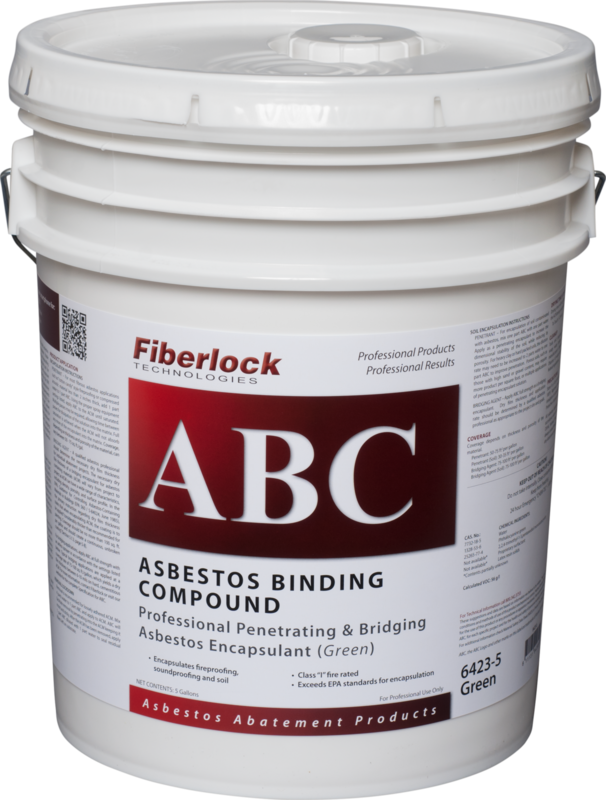 For most fibrous asbestos applications such as “cotton candy” style fireproofing or compressed acoustic material less than 2 inches thick, add 1 part water to 1 part ABC. Using the proper spray equipment settings listed, apply ABC to the ACM until saturated. Multiple passes may be required, allowing time between passes for dissipation of the solution into the matrix. Full saturation is achieved when the ACM will not absorb any more of the encapsulant into the matrix. Coverage, depending on thickness and porosity of the material, can vary between 50 – 75 sq. ft./gal. A qualified asbestos professional should determine the necessary dry film thick ness for individual abatement projects. The necessary dry film thickness of a bridging encapsulant for asbestos containing materials (ACM) will vary from project to project as ACM can have a wide range of characteristics, including density, porosity, and surface profile. In the EPA’s Guidance for Controlling Asbestos-Containing Materials in Buildings (EPA 560 / 5-84024, June 1985), the primary instruction regarding dry film thickness states that when encapsulating ACM, the coating is to be applied “considerably thicker than recommended for painting. Coverage should be no more than 100 sq. ft. per gallon and should create a continuous, unbroken coating” (Section 5.1.3, page 5-8). For bridging applications, apply ABC at full strength with an airless sprayer in accordance with the settings listed below. Typical bridging applications are applied at a coverage rate of 75-100 sq. ft./gallon, which yields a dry film thickness between 6-10 mils on hard, cementitious ACM. For more information, contact Fiberlock or visit our website for the complete Specification for ABC. Removal is recommended for loosely adhered ACM. Mix 4 parts water to 1 part ABC and apply to ACM. ABC will facilitate removal by penetrating into the ACM keeping it moist and sticky. 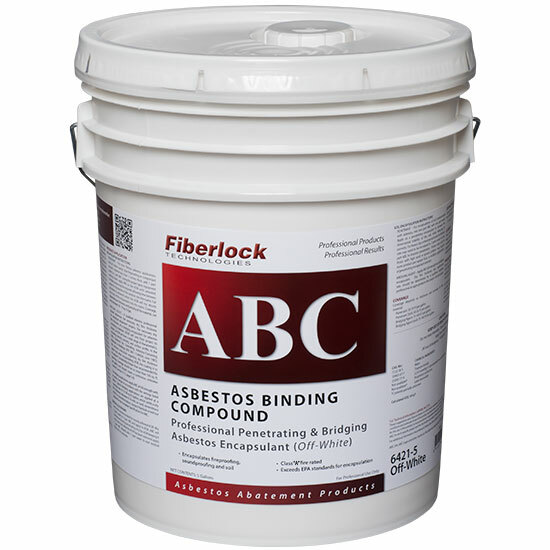 After the ACM has been removed, apply 1 part ABC diluted with 1 part water to seal residual fibers left on substrate. 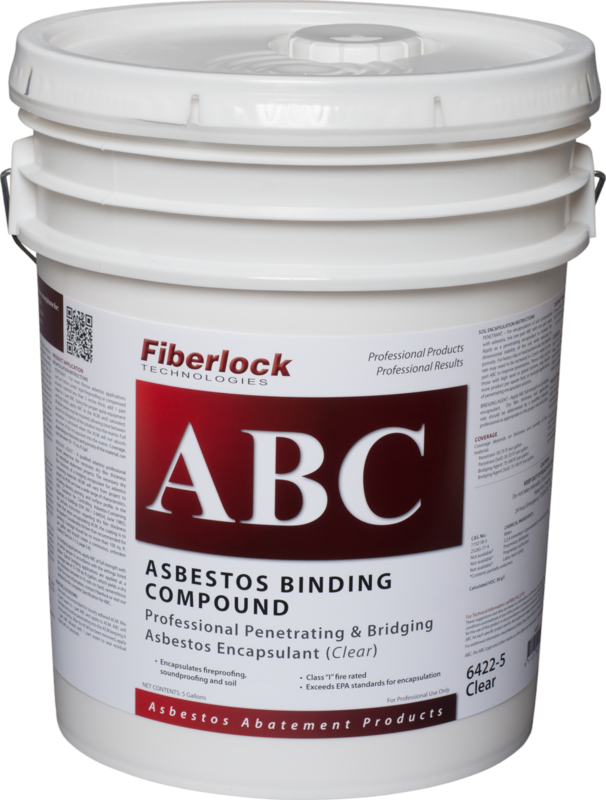 For encapsulation of soil contaminated with asbestos, mix one part ABC with one part water. Apply as a penetrating encapsulant to increase the dimensional stability of the soil, while reducing its porosity. For heavy clay or hard packed soils, the dilution rate may need to be increased to 2 parts water to one part ABC to improve penetration. Porous soils, such as those with high sand or gravel content, may require more product per square foot, or multiple applications of penetrating encapsulant solution. Apply ABC full strength as a bridging encapsulant. Dry film thickness and application rate should be determined by a qualified asbestos professional as appropriate to the project site and goals. Coverage depends on thickness and porosity of the material. Penetrant (Soil): 30-35 ft2 per gallon. Bridging Agent: 75-100 ft2 per gallon. Bridging Agent (Soil): 75-100 ft2 per gallon. Drying time will vary based on thickness and porosity of the ACM being encapsulated. Store in a dry place at temperatures between 40°F (4.5°C) and 90°F (32°C). Approved respirators must be used to prevent inhalation of asbestos fibers that may be present in the air. Protective clothing should be worn. When applying with a sprayer, wear a NIOSH approved respirator with any R, P, N or HE filter.